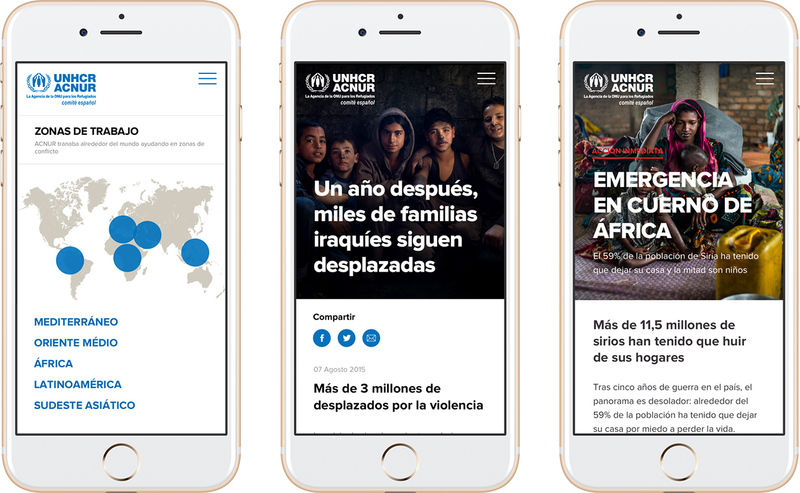 The Spanish Committee of ACNUR, the UN Agency for Refugees, has a work team of more than 700 people whose objective is to contribute funding in order to resolve humanitarian emergencies. Distributed in 7 physical headquarters, the challenge was to increase the support of their more than 400,000 members and contributors and help to convert prospective members beyond their geographical distribution. 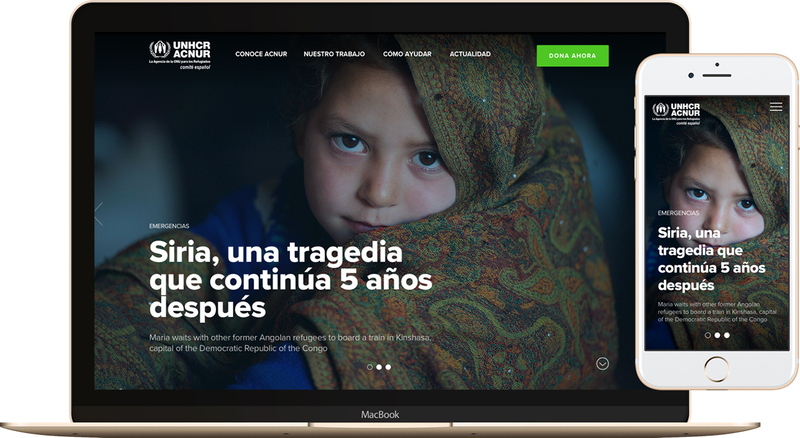 With this aim, ACNUR opted to grow their digital channel, entrusting Secuoyas with redesigning the main web page, the landings network and the platform which provided them with content and supported the registration process of members and donations. The main objective was to create awareness, commitment and promote knowledge about the humanitarian work that they are doing. Who, how and why do people donate? Having a omni-channelled vision, understanding the conversion process of members from their first contact with the street recruiters and visualising all of the contact points that they had with the organisation, was the original premise. We carried out several sessions of interviews and observed work both in the street and in the office in order to understand said work in its totality, from the areas of coordination to the process of welcoming a new member. We constructed a specific Use Case of the registration of a new member and listed the different forms of contact that they had with the organisation before, during and after this process, all the time monitoring the very same process in other organisations. This tool helped us to visualise what information was given to the future member in each part of the process, their possible feelings of rejection, mistrust or empathy and, most importantly, if any relevant information was not given at the appropriate time. ACNUR has a high-impact rapid response given that they are capable of helping more than half a million people directly in less than 72 hours. It was necessary to communicate this capacity, to create trust, to form distance from compassion and show their efficiency, as ACNUR is the agency which paves the way upon which others can carry out specific tasks. The same values can be communicated in different ways and each one requires different attention on the part of the user. By knowing the contact points of the current and potential member, the different channels - web, e-mail, telephone, face-to-face - and taking into account the different types of donation, we were able to classify the content in order to work on it along the right line and refocus on its message, tone, format, architecture and taxonomy. We worked in terms of what and how much information is needed in each moment and what should be its focus; we restructured the hierarchy of the call to action; the elements which should be highlighted; how to submit the different types of contributions and, mainly, how to make sure that contributors wanted to collaborate as members and how the members may become advocates. 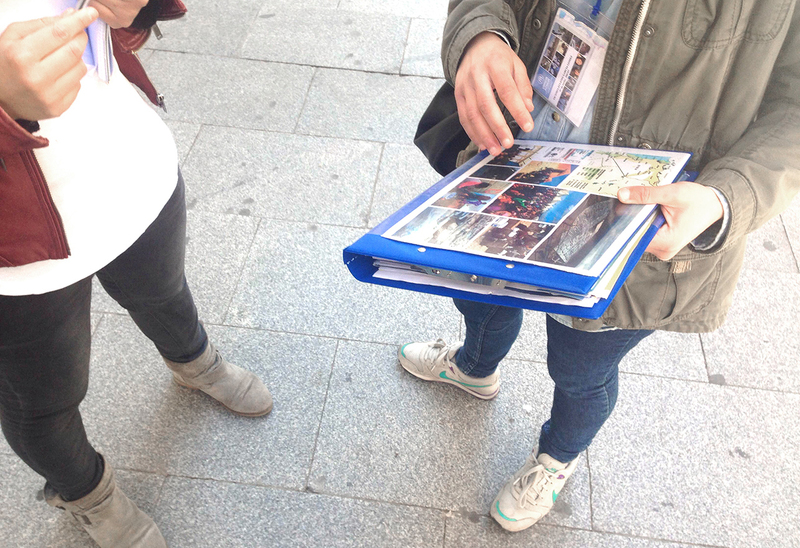 The face-to-face channel has the most impact when attracting members, in which the volunteers and workers of eAcnur establish a conversation of about 15 minutes with those who appear to be interested. In this space of time both the website and other graphic materials are shown which indicate what ACNUR is working on and how they do it. It is also one of the opportunities to carry out the most critical process: gathering the potential member’s details. 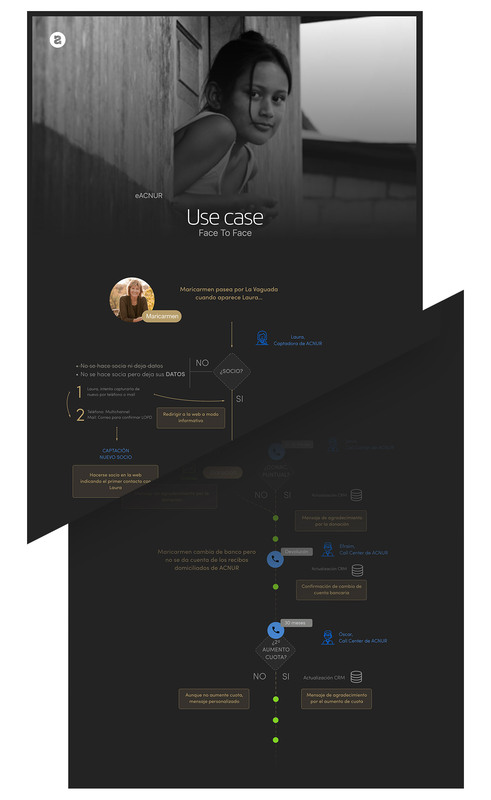 As it is the most complex scenario, we used it as the starting point for the visual design of the website. Typically, pedestrians do not have a lot of time and are somewhat reluctant to stop. If the recruiter needed to use the website to provide back-up for their argument it was important for the design to accompany and help them to catch the potential member’s attention, and for the registration process to be extremely easy. The readability, the image-text hierarchy, the contrasts, the use of blank space and the use of videos were the main points that we developed in order to create awareness and increase solidarity and implication, without losing sight of the viability of its construction on a technological level and, above all, the ease of maintenance on the part of the client. To ensure that we had found the right solution, we carried out a test with a dozen or so users of the main tasks, on mobile phones and desktop. With their feedback, and by observing their emotions, we made a few adjustments in order to guarantee perfect understanding of the content and the processes.